Chevrolet’s new SUV, the Trax, has been awarded the top five-star rating by the European New Car Assessment Program (Euro NCAP). The Trax is the seventh Chevrolet model to receive Euro NCAP’s top score, alongside the Aveo, Volt, Cruze, Orlando, Malibu and Captiva. Despite being evaluated under the new more stringent 2013 Euro NCAP protocols, the Trax proved to be among the safest cars in its segment. Susan Docherty, President and Managing Director of Chevrolet and Cadillac Europe, said: “We are really proud of the five-star NCAP test result, confirming what Trax customers expect from our new small SUV. “The bold and rugged Trax exterior design suggests a high level of safety at first glance. In the Adult Occupant category, the Trax scored 94%, while it also achieved maximum points in the side barrier test, providing occupants with good protection for all body regions. Good scores were also received for frontal impact and whiplash protection, due to adjustable seat and head restraints in the eventuality of a rear impact. In the Child Occupant category, the Trax received favourable results in the side impact test and child restraint installation. The vehicle also scored maximum points in the Pedestrian Safety category, while requirements were met by the car’s standard safety equipment in the Safety Assist category. 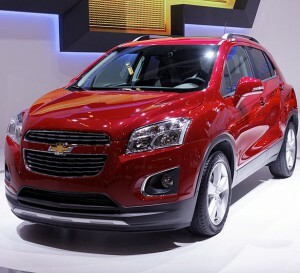 Chevrolet released the Trax to their European dealerships in May. Image courtesy of Thesupermat, with thanks.